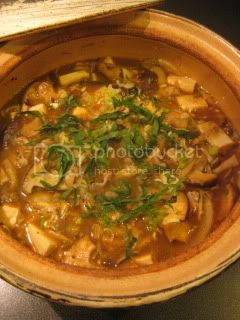 HAPPY DONABE LIFE - Mrs. Donabe's Rustic Japanese Kitchen: Donabe vegan dish...Vegan mushroom "Mabo Tofu"
Mabo Tofu in donabe is one of my regular dishes. Instead of making it with ground pork, this time, I made vegan version of Mabo Tofu with mushrooms. It came out so tasty! 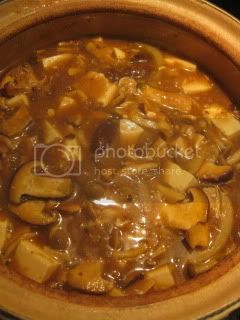 For this dish, I use Classic-style donabe, "Hakeme". First, I sauteed garlic, ginger, scallion, and minced fermented black beans in sesame oil. 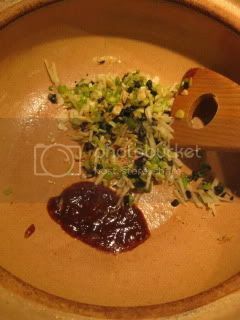 I also lightly sauteed some doubanjiang (Chinese hot bean paste) separately until fragrant before mixing with them. 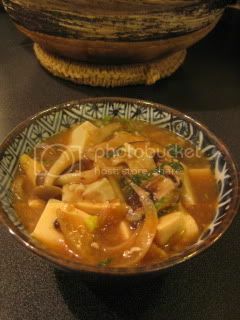 Once the mushrooms were sauteed, dashi stock, sake, miso, soy sauce, and tofu were added. The ingredients were simmered for 6-8 minutes. The broth was lightly thickened by stirring in the mixture of katakuriko (potato starch) and water. After a couple of minutes, the heat was turned off and the mixture was rested (with the cover on) for a few minutes (because Iga-yaki donabe has the remarkable heat-retention ability, after turning off the heat, it continues to simmer for a while). My mushroom mabo tofu was ready. The flavor was so rich and tasty. Frenshly-made donabe rice made the nice accompaniment. 1. 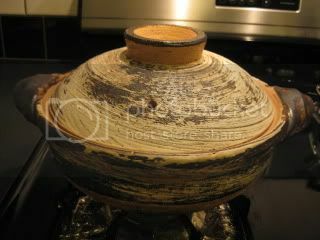 In classic-style donabe, heat the sesame oil over medium heat. 2. Saute the garlic, ginger, scallion, fermented black beans, and Szechwan pepper until aromatic. 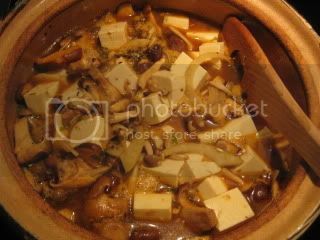 Push them to one side of donabe and add dobanjiang to the other side and saute until aromatic. Stir them together. 3. 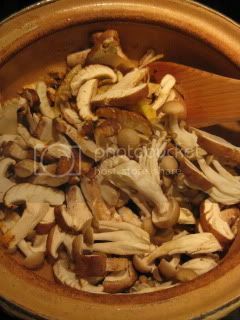 Add the mushrooms and saute until soft. 4. Add the dashi stock, sake, miso, soy sauce, and brown sugar and stir. Add the tofu. 5. Bring to a boil and reduce the heat to simmer. Cover and simmer for 6-8 minutes. 6. In a small cup, whisk together katakuriko and water. Stir in the mixture to the donabe. 7. Simmer for 2-3 more minutes. Cover and turn off the heat. Let it rest for 3-5 minutes. 8. Garnish with some sliced scallion and shiso leaves. Drizzle some la-yu to enjoy.